Driving is fun on short distances but on a long drive, it can be very exhausting. The body parts that suffer most from this fatigue are the head and neck because as you drive, you must hold your head up for all those hours. One simple solution that can help you avoid all this is the use of a car neck pillow, which is simply a cushion that is attached to car seat around the headrest area, thereby providing crucial support that will certainly make a long drive feel much shorter. There are different types of these pillows though and to help you pick one that suits all your needs, the review below covers 10 of the best car neck pillows that you can get in the market. Though expensive, Aukee’s memory foam pillow is, as the name suggests, composed of memory foam in its inner core, which is designed to release the pressure of the cervical vertebrae as effectively as possible. 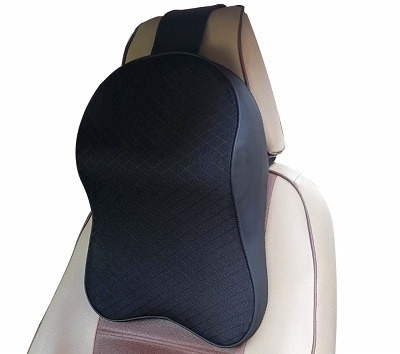 In the process, the pillow provides good support to the head and neck and enables you to maintain a proper posture for comfortable driving. 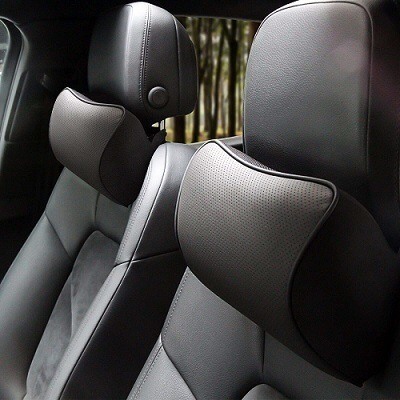 Apart from this, a high-quality grade A cow leather finish also contributes towards the high cost, but it creates a durable outer layer and this makes it the top-rated car neck pillow. Instead of one, this kit contains 2 headrest pillows, enabling you to afford the same level of comfort to the front passenger as you drive. While the two pieces are primarily meant for car use, they are multipurpose pillows that can be used in airplanes, trains, when watching TV, napping, studying and many other areas. Other features include an environmentally friendly construction (space memory cotton), an easy to clean design due to the leather surface and this outer jacket is removable for further cleaning. Multipurpose use in driving, napping, watching TV, etc. The infinity shape of Langria’s car neck pillow is its greatest strength because, with the sunk middle section, you get an ergonomic neck curve design that provides superb neck support, preventing pain and stiffness. Another benefit with this product is its easy maintenance process, in which the outer cover is removable and can be machine washed, enabling you to maintain hygiene quite easily. However, the inner memory foam should not be machine washed or machine dried. 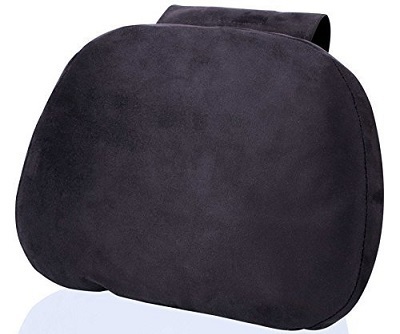 This outer cover has a strong elastic strap attached to it, which is used to anchor and fasten the pillow to the seat so as to ensure it remains in one position as you drive along or as you are traveling on a bus, plane or train. On the downside, you only get a single piece and it usually has a minor odor associated with its manufacturing process when new. This though should only last for about 72 hours after unpacking the product. Can be used on cars, buses, planes, etc. 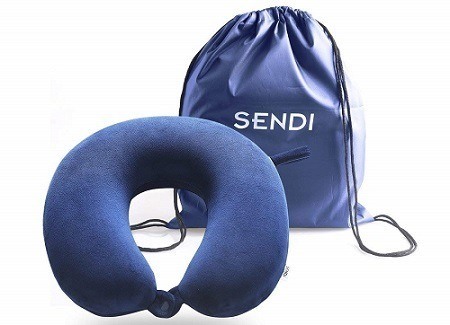 Sendi’s car neck pillow features the signature U shape that is known for traveling purposes. This is because it provides good support to the neck while also preventing leaning towards the neighboring passenger (in planes mostly) and keeping the head from falling forward. A removable and machine washable microfiber cover makes it easy to maintain hygiene, and it is breathable so as to disperse heat for comfort. On the inside, a memory foam cushion doubles up the comfort level, creating a better sleeping experience for the long journey. Even though it is packed as a single piece, the pillow comes with a carry bag for easy transportation as you move around, and it can also be easily attached to carry-on luggage without taking up any space due to its built-in snap strap. Other features include a hommization snap button that locks the pillow around your neck to prevent it from falling off and blue and gray color options to match different car interiors. You can also spend less to get a good car neck pillow such as this one from Aeris, which is still a high-quality product. It features a highly responsive memory foam on the inside that provides excellent support and has a dog bone shape that fits snugly around the back of the neck. This foam actually yields slowly under pressure because it is composed of a visco-elastic temperature sensitive material, which molds to your neck’s contours. For hygiene purposes, the interior memory foam layer is coated using two outer layers, one being a non-removable internal cover that conceals the foam itself while an external machine washable cover makes it easy to clean, and it has a plush velour construction that gives it a luxurious feel. Other features include a carry bag that compresses the pillow to half its size for easy transportation and an odorless new piece as it is aerated for 7 days before packaging to ensure the manufactured memory foam dissipates this smell. If you prefer having that cervical roll type of pillow that conforms perfectly to your neck’s curve, then this piece from Alibo is the best product to consider. This rounded design provides great support to the head and neck, which contributes a lot towards improving the driving experience or even napping on long trips. A great contributor towards this good support is a memory foam interior, which is very soft and retains heat so as to alleviate tension muscles. Satin fabric is used to build the outer cover, which adds its own level of comfort and luxury while also being machine washable for easy maintenance. Other features include a compact design that you can carry anywhere with you, an adjustable strap for fixing on car seats and availability in black and beige colors so as to match light or dark colored car interiors. 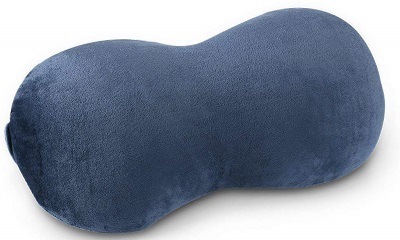 This is the smallest car neck pillow in this review, measuring only 10 x 5.5 x 4 inches in size. However, what it lacks for in size, makes up for it in comfort and is actually chiropractor recommended because it provides excellent head and neck support. At the same time, this pillow enables you to maintain proper spine alignment, which reduces muscle and joint discomfort. A memory foam interior makes it soft for comfort while a plush velour outer cover enhances this and adds a touch of luxury. In addition to this, the velour outer cover is removable and can be machine washed for easy maintenance. Other features include a black only color option and a built-in elastic strap for holding the pillow in place on the headrest. Zatooto’s car neck pillow stands out as the best memory foam pillow because of a number of reasons. 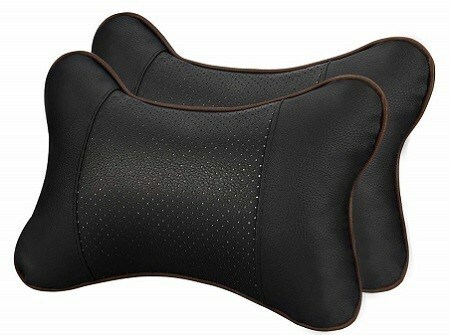 First, it is a 2-in-1 product that is a headrest pillow and also provides lumbar support, leading to extra comfort. This is because it is quite long and wide, providing support over a larger area that encompasses the head, neck, and shoulders. While providing this wide coverage, a high-density memory foam interior gives a slow rebound and no deformation, ensuring that you get good support as you drive, especially for long distances. Another benefit with this product is that it can be adjusted as you raise or lower the headrest because it has a belt plus elastic design at the back that can be better fixed to the seat. Black, beige and wine-red color options are available for matching with different car interiors or personal tastes. 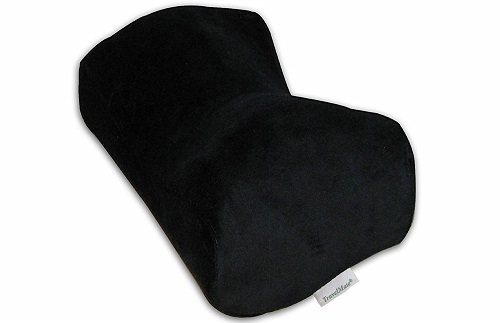 For a soft and smooth driving pillow, this unit should be your go-to option because it has a plush velvet microfiber cover that is very smooth to the skin and an even softer interior that provides excellent head and neck support. Just like Zatooto’s unit above, this one has a wide face that provides support over a larger area of your body, and it has wide compatibility due to this size. The unit can fit on all car seat headrests with regulating levers, which means that you can use it on any of the cars that you choose you to drive. Installation is also quite simplified with the use of Velcro straps, which easily fit over the headrest and are also easy to remove. Other features include strong and secure stitching for durability and a removable cover that is machine washable. With this product, you get 2 car neck pillows, one for you as the driver and the other for your passenger, making it a very practical kit. Each one of them has a dog bone shape, with a foam construction inside that does not deform and is shrink proof, giving you more comfortable support under your head and neck. In addition to this, the center part of the dog bone design is composed of a breathable leather cover, which takes comfort to a new level, providing a leather-class experience while also being comfortably warm with the avoidance of perspiration. The foam inside is also good at retaining heat and this helps to alleviate tension in muscles. More features include black, gray, beige and brown color options, invincible zipper stitching and a high strength elastic strap for holding the pillow to the headrest. 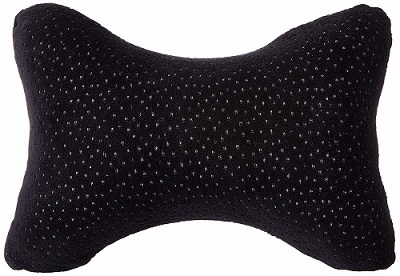 Gusodor’s car neck pillow is very similar to Camtoa’s product above, coming as a set of 2 pillows that both have a dog bone design, which fits perfectly on the contours of the neck. 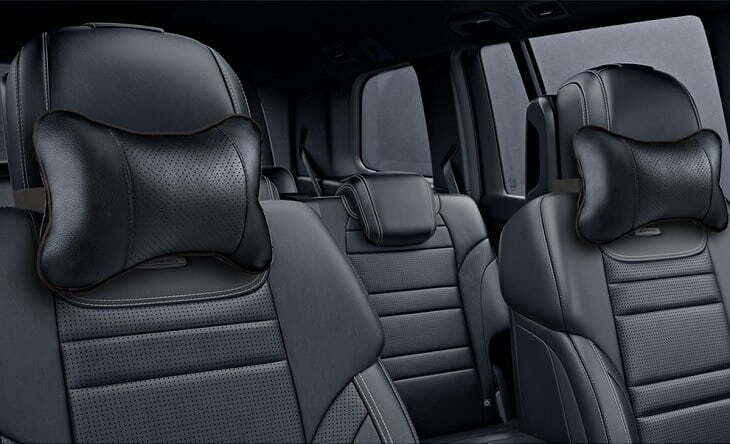 With a memory foam interior, the pieces comfortably support the head and neck while also relaxing your muscles, and this drastically improves your driving experience. This foam is covered using a perforated leather cover that greatly enhances the breathability factor for additional comfort. The leather is also very tough and durable and is skin friendly. Other features include small, compact size and a flexible strap for attaching each piece to the headrest. In this context, compatibility basically shows which areas or which cars the pillow can be used in. The different car makes have different types of seats and this is what brings in the compatibility factor. Generally, large car neck pillows with wider faces have a more universal fit since they cover a large area and thus, they will sit comfortably between the headrest and the other part of the seat, even if you adjust the headrest’s height. 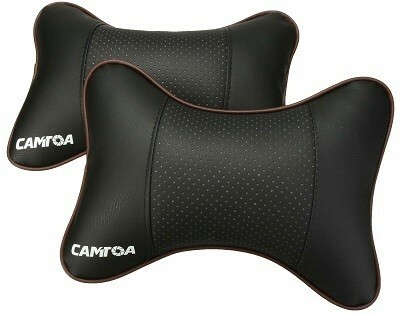 Therefore, if you want a universally compatible car neck pillow, look the wide ones. Small-sized car neck pillows have the advantage of being compact and easy to carry, making them usable in cars, planes, trains, and buses because you can easily tag them along. However, their small size means that they provide support over a small area and thus, might not be very comfortable. On the other hand, large pillows have bulky and weighty disadvantages on their side, but they provide excellent support over the head, neck and even shoulders. They are perfect if you want a pillow that will be permanently placed in your car. To achieve portability and comfort though, it is recommended to get one that is neither too big nor too small by looking at and comparing the dimensions. Apart from size, car neck pillows are available in different shapes such as dog bone, infinity, cervical roll (rounded), U shape and the regular boxy shape. There is no way of telling which one is best because all provide the head and neck support that is required and therefore, the decision here should be based on personal preference, considering which shapes works best for you. This is one of the most important things to consider because it directly affects the comfort that you will get. Even though most of these pillows have memory foam interiors, some have a high-density foam that is firmer and more resistant to compression than regular memory foam. However, the choice between the two is also down to personal preference because some people prefer the soft, sink in type while others prefer a harder foam. Another thing to consider is the outer cover material. The best cover should be breathable so that you don’t perspire a lot, and should also be easily removable for washing by hand or machine, or easy to wipe such as leather material. This is important for hygiene purposes because even if the material is breathable, dirt and sweat will still form on the surface after some time. People who drive for long distances or those who drive for a living need to consider a car neck pillow that affords them more support, with firmer foam cores and more durable designs. They should also look for wider pillows that support a larger area, covering at least the head, neck, and shoulders. Units bearing such features might be more expensive but they will definitely impact your driving experience in a positive way. In conclusion, in selecting a car neck pillow, personal preference and cost are the main things that will determine your pick. Be it large or small sized, infinity or U shaped, all of them have their own advantages and disadvantages that make them suitable for a specific type of driver. Therefore, after going through the content above, it is our hope that the selection process of the best car neck pillow for you will be much simpler.